What's Next: Bob Iger Wins Fox: Comcast has dropped its pursuit of 21st Century Fox, allowing Disney to proceed with its $71.3 billion takeover of Fox's entertainment assets. The deal will give Iger the most formidable content portfolio in Hollywood, from the Marvel Cinematic Universe and the X-Men to "Star Wars" and "The Simpsons," as well as majority ownership of Hulu. But ... it does not bring an end to the war between Iger and Brian Roberts. Comcast says it will now focus on its pursuit of Sky Broadcasting, the major direct-to-consumer platform in Europe that Iger had hoped to acquire through his purchase of Fox. • Can Disney now tower over Hollywood? 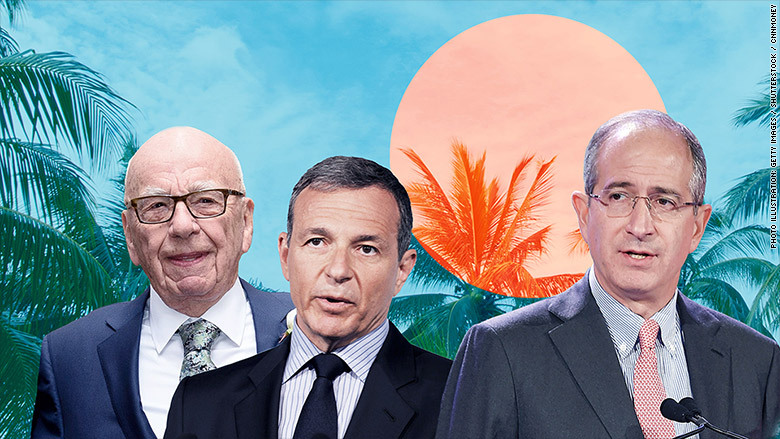 • Will Iger and the Murdochs cede Sky? Good morning. One week from tomorrow, Fox shareholders will gather at the New York Hilton in Manhattan to vote on Disney's takeover offer, which has already won approval from the Justice Department. ... Iger may be just days away from securing his prize. Closer to Home: My boss Jeff Zucker has announced he will take a six week leave to undergo elective heart surgery to address a long-standing condition. "He assured everyone he is going to be just fine," my colleague Brian Stelter tweets. "All of us are wishing him a very speedy recovery." Amen. "Holy crap." That was Bob Iger's response when he was informed by CNBC's David Faber that Comcast had decided to drop its pursuit of Fox. The Big Picture: Disney may now be the only pure media player that can compete with both Netflix and the tech and telecom giants that are rapidly taking over Hollywood, simply because of its unparalleled content portfolio. Disney will now be able to offer all this content through direct-to-consumer platforms it's launching on its own and the ones it will acquire through Fox: Hulu in the US, Hotstar in India and, possibly, Sky in Europe. Hardest Hit: Netflix. Disney announced last year that it will pull out of Netflix by the end of this year, which means anyone who wants access to the aforementioned franchises will need to go through Disney. Consolation Prize: Who gets Sky? Open question. Now that he's not chasing Fox, Brian Roberts can compete a lot more aggressively for the UK broadcaster. Technically, Rupert Murdoch is the one bidding against him, but he is doing so on behalf of Iger, who will assume the ownership and the debt. Neither Disney nor Fox are commenting. Make no mistake: Iger wants Sky. He's called it a "crown jewel" of the Fox assets, and it would give Disney instant direct-to-consumer relationships with 23 million subscribers across five European countries. Roberts: "I'd like to congratulate Bob Iger and the team at Disney and commend the Murdoch family and Fox for creating such a desirable and respected company." Iger: "Our incredible enthusiasm for this acquisition and the value it will create has continued to grow as we've come to know 21st Century Fox's stellar array of talent and assets. We're extremely pleased with today's news, and our focus now is on completing the regulatory process and ultimately moving toward integrating our businesses." Real Talk: Iger and Roberts really don't like each other. Thunder Road: Netflix lands Springsteen ... why not HBO? Why didn't HBO land the rights to Bruce Springsteen's Broadway show? Netflix did, and it will release it as a special this December. NYT's Michael Paulson reports that Springsteen "invited a private audience for two extra performances this week — one Tuesday and one Wednesday — while cameras recorded the event for the special," which will air December 15. The Big Picture: Five years ago -- hell, three years ago -- this would have been on HBO. The now-WarnerMedia network ran a Springsteen documentary in 2010 and broadcasts the Rock and Roll Hall of Fame induction ceremony every year. It's right in their wheelhouse. Maybe HBO didn't want it. But if it did, it would have needed to do three things to land it: Recognize the opportunity, establish the necessary relationships and pay the appropriate price. If WarnerMedia is serious about competing with Netflix, it needs to push HBO to do all three. • A stand-up comedy channel on Sirius XM. • A 'Midnight's Children' TV series from Salman Rushdie. • A new French original starring Omar Sy. • Facebook is a platform connecting people. • People have a right to free speech. • Once you start telling people what they can and can't say, you go down a slippery slope of censorship. This dispassionate worldview does not do well in these very, very passionate times. So when Zuckerberg told Recode's Kara Swisher that Facebook would not take down a post denying the Holocaust, he brought his company back into an all-too-familiar spotlight. • "I'm Jewish, and there's a set of people who deny that the Holocaust happened. I find that deeply offensive. But at the end of the day, I don't believe that our platform should take that down because I think there are things that different people get wrong." • "I enjoyed our conversation yesterday, but there's one thing I want to clear up. I personally find Holocaust denial deeply offensive, and I absolutely didn't intend to defend the intent of people who deny that." • "Our goal with fake news is not to prevent anyone from saying something untrue -- but to stop fake news and misinformation spreading across our services. ... These issues are very challenging but I believe that often the best way to fight offensive bad speech is with good speech." The zeitgeist is against Zuckerberg, and for good reason. Facebook is a publisher, and being a publisher means being responsible for your content. Facebook is also trying to convince the world that it is working to combat misinformation, and Holocaust denial is the creme de la creme of misinformation. What Next: The Supreme Court of California has put the kibosh on that asinine plan to split up California.